To be successful on the Web, you have to run eCommerce as you would run a bricks and mortar store - like a business. You not only must build an attractive storefront on the Web, you then have to keep looking for ways to turn browsers into customers, and then make sure you keep your customers returning by giving them high quality service. WebSphere® Commerce is about much more than building an attractive eCommerce Web site to display and sell from a catalog of products. It is about running a competitive eCommerce business, running marketing campaigns and promotions to generate sales, and running an efficient back office to fulfill orders and keep your customers coming back for more purchases. We asked a team of WebSphere Commerce experts who have many years of experience creating and deploying eCommerce solutions for some of the largest, and some much smaller retailers and business to business customers, to get together and write a book about it, and pass on their expertise to clients coming new to the world of WebSphere Commerce . 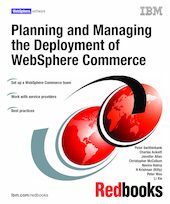 This IBM® Redbooks® publication shows you how to start planning to use all the capabilities of WebSphere Commerce effectively, to improve your business, and also to do eCommerce efficiently on a global scale.